No machine or process can operate without controls. 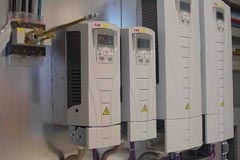 Those controls must be housed within robust panels and must be fitted with the utmost care. Moekotte utilises a wide range of products available on the market. Our range for example comprises Rittal, Siemens, ABB and Moeller etc., all of which supply branded quality products. 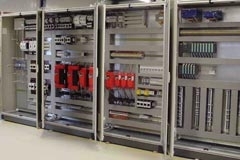 Moekotte is of course experienced in all of the latest technical applications, including bus-controlled motor groups, operator panels and frequency converters. This makes the working process more efficient, improves panel lay-outs and reduces the number of components that need to be assembled. It goes without saying that our control panels meet the CE standard and are assembled in accordance with the quality system in place at Moekotte, namely the ISO 9001-2000 quality system. Thanks to our effective purchasing management, Moekotte is able to operate economically and thereby guarantee rapid turnaround times. A team of our specialists is waiting ready in our workshop to make your control system designs a reality.